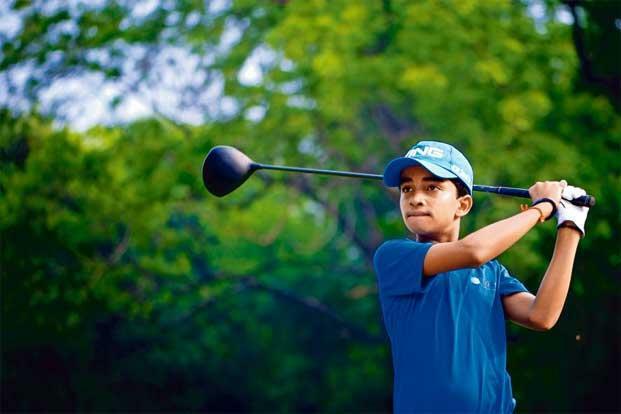 ​13-year-old child prodigy ​one of India’s finest young golfers. Shubham Jaglan was born on 16 August 2004 at a Village called Israna, in Panipat district, of Haryana. His father Jagpal was a milkman by profession, and his entire family had a wrestling background. While taking up wrestling was like fish taking into the water for his family, His grandfather admitted him to a Golf academy started by an NRI Kapur Singh in his own village. Though the NRI was keen on promoting the game in this rural part of India, the apathy of the majority of villagers in admitting their wards to Golfing resulted in the shutdown of the club. But, by then Shubham’s flair for the game had come to the notice of Kapur Singh, and he insisted his father to encourage and nurture his talent by admitting to Karnal Golf Club. It was really challenging for his father Jagpal to arrange for his practice. He took an innovative method by transforming mustard field in their backyard into a green field with three holes—thus a Golf Club came into play in the remote place of Israna! The next challenge was how to bring in mentors/coach to this remotest place who obviously resides in posh localities of cities. Jagpal bought a computer for his son with an Internet connection, and YouTube videos became the mentor for this boy. It is amazing to know that Shubham was just five years old then. Shubham learned fundamentals from Youtube videos and practiced in his backyard. But definitely, he needed match practice too. His father dedicated his entire time to take this boy to Karnal Golf club and also to Delhi Golf Club. Thus Shubham started acclimatizing with talented players in the area. It was during his visit to Delhi Golf Club, Amit Luthra, Founder of Golf Foundation came to know about this boys talent from his father. Shubham’s father approached Amit requesting him to direct the authorities to reinstate a tournament designed for below 8-year-old children. Authorities had debarred this format citing the reason these kids are not serious about practice and would simply spoil the greenery by taking frequent milk and snack breaks. Amit Luthra directed the chief mentors to find out the talent of this boy and when he got positive feedback. The Golf foundation decided to fund this boy with 2 Lakh rupees per year for practice needs. This gesture boosted the morality of his father, and Shubham’s family relocated to Delhi to provide him professional training. Thus Shubham could better schooling and professional golf training at country’s capital. Jaglan has won over 100 domestic and international tournaments. Among these championship victories, Shubham Cherishes his World Masters Junior championship victory the most as it was his first ever experience of winning an international fixture. When asked about his future plans Shubham speaks with crystal clarity that his love for the game for is uncompromising and along with his practice he wants to complete college studies. Apart from these victories, Shubham has been rewarded with recognition from various organizations. Like “NDTV – Emerging Player” and “Margdarshan” awards.